Ray, Emma, and I would like to wish all of our friends and family a very Merry Christmas. May you embrace the spirit of the season and enjoy time with your own families. Emma taking some time to laugh at us as we act like clowns to try and get her to smile for the pictures. Emma in her Christmas PJs that we picked up in Las Vegas at Baby Gap. They are too cute! She enjoyed the freedom of movement they allowed. 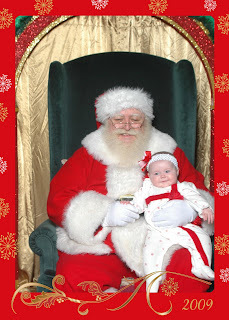 Friday, December 18, 2009 Emma had her 1st Christmas Party at Day Care. Her gift to the other children were Christmas balloons! Emma is starting to show more affection by grabbing and giving hugs and kisses. She also like to grab my hair and Ray's goatee. Ray took her to her party and she had a great time and received many thoughtful and sweet gifts from her friends at day care. This is our Emma dressed as a present. She is the most precious gift God has given us and we are very grateful to have her in our lives. Mommy and Emma in front of the tree. Now we are both heading out to start our day. May God bless you all as he has blessed Ray and me. Emma went to sleep at 8:00 and woke up in the middle of me taking my final last night. She was wide awake. So... Ray holds her and tries to entertain her while I am working on my final and she is just not satisfied. Emma has started to wiggle in our arms to let us know she wants to get down and play. Apparently all she wanted was to be on the ground with her toys! She is trying to crawl, but us just not there yet. At one point when she was trying to get to one of her toys without any luck she called out Dad in her frustration. Of course Ray went to her rescue and assisted his baby girl in reaching the toy she wanted.